Located on the banks of Loire river, the Brit Hotel Akwaba welcomes you for a resourcing trip to Ancenis. Only 5 minutes away from the train station and city center, our hotel is ideally located and open 24/7, so that you can come whenever you need. Because your safety is one of our top priorities, you’ll have access to a safe-deposit box to store your valuable belongings. A night watchman also makes rounds all night long. Everything is set to make sure that you sleep soundly at the Brit Hotel Akwaba! You can leave your car in a free and closed private parking. Pick one of our 56 rooms: standard, family or suites, we have all kinds of cosy rooms! 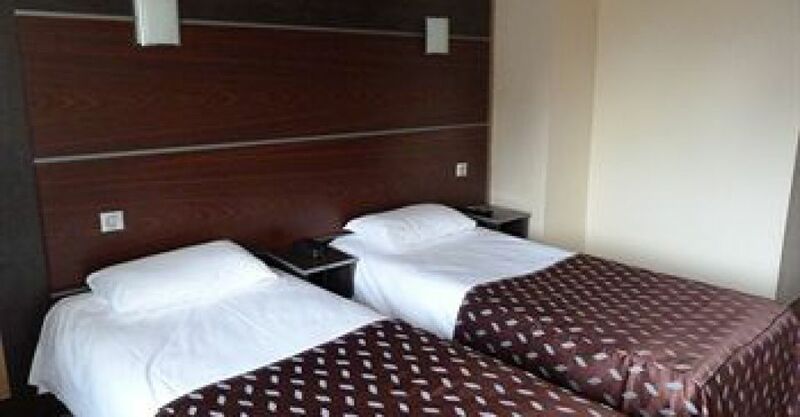 Each room has a bathtub or a shower, a hair dryer, a telephone, free Wi-Fi as well as a flat screen TV with Canal + and BeIn Sports to entertain your evenings. Want to socialize? Mingle in the cosy TV room or share a drink at the bar of our Ancenis hotel. At breakfast time, enjoy our delicious and energizing buffet of local products. Have lunch or dinner in one of Ancenis’ best restaurants…at our hotel! Decorated in a tasteful style, « La Route du Soleil » serves refined dishes in a warm atmosphere. For business events, the Brit Hotel Akwaba has two air-conditioned meeting rooms of 20 and 50 sqm to suit your needs. You’ve found the ideal place at the Brit Hotel Akwaba, so book your room at our hotel in Ancenis!